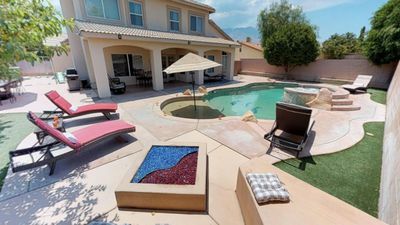 Treat yourself to an unforgettable La Quinta escape by staying at this custom designed 3-bedroom, 3.5-bathroom vacation rental home! 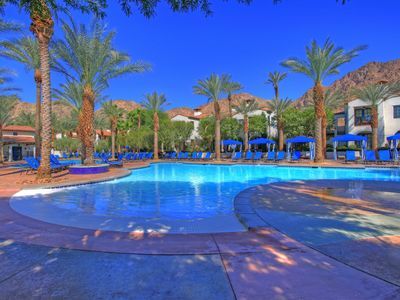 Nestled in the beautiful gated community of Rancho La Quinta Country Club, this getaway offers sleeping arrangements for 6, an amenity-filled patio, and access to a community pool and hot tub. Whether you spend your days golfing, hiking, shopping or relaxing, you’ll love having this tastefully appointed villa as your home base! 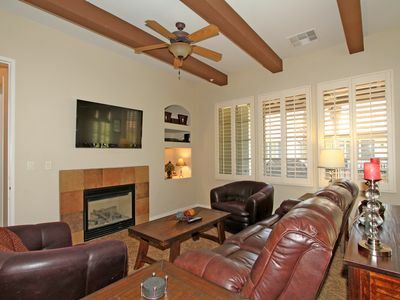 This spacious abode offers all the comforts of home, from the open-floor plan to the wireless internet throughout! 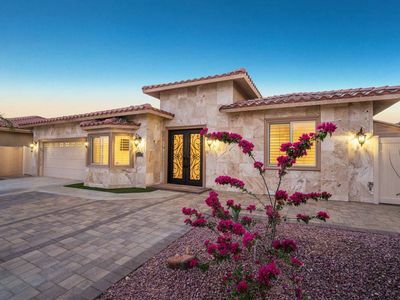 The interior features are endless and include high ceilings, custom built-ins, and Travertine floors. 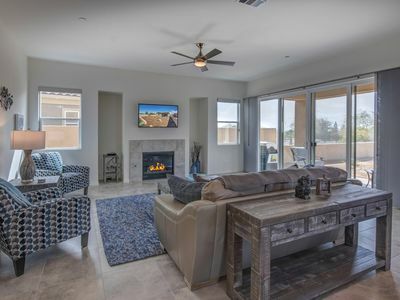 You can easily beat the desert heat in the expansive living room, where you’ll find a flat-screen cable TV with sound bar, dramatic floor-to-ceiling gas fireplace, and central air conditioning. Neighboring the living room is a fully equipped kitchen outfitted with a double oven, stainless steel appliances, and granite countertops! 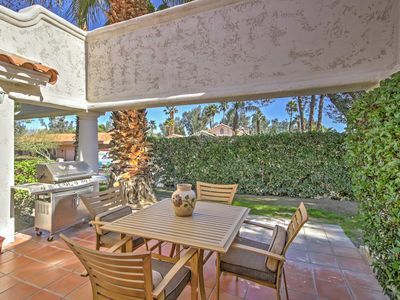 Meals can also be prepared in the outdoor kitchen which includes a gas grill, small stove, mini-fridge, and an eating bar. 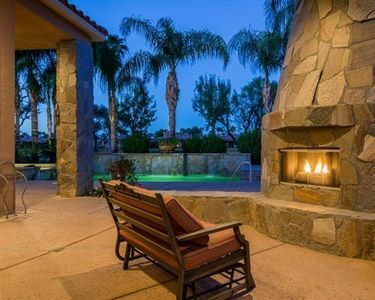 After savoring a meal al fresco, relax on one of the loungers or around the cozy fire pit to admire the spectacular views of the 3rd fairway of the Jones course and western views of the Santa Rosa Mountains. 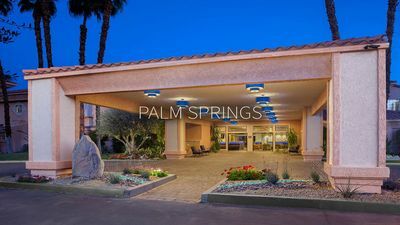 As the sun sets, take the 2 cruiser bikes for a spin around the beautiful Rancho La Quinta Country Club neighborhood or pop over to the quiet community pool and hot tub - conveniently located across the street! Each bedroom throughout the home has its own en-suite bathroom, ensuring privacy for your guests. 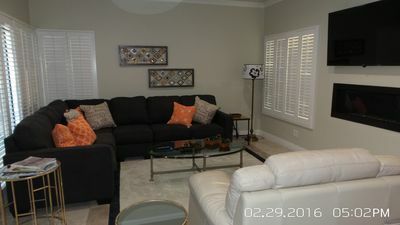 The master suite and the guest suite are both outfitted with California King beds and the third bedroom has 2 twin beds. The roomy master bath has a separate shower, jetted soaking tub, dual vanities, marble countertops, and a walk-in closet! 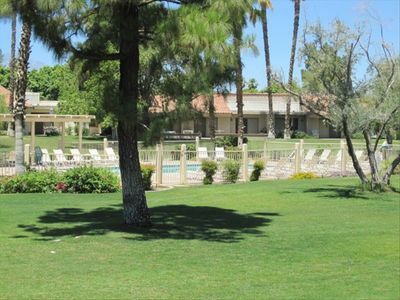 La Quinta is brimming with things to do all over the area! Go on a desert adventure in the Santa Rosa and San Jacinto Mountains to explore the stunning desert terrain! 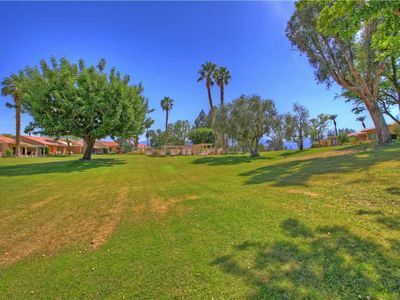 You'll find several hiking trails within minutes of the property. 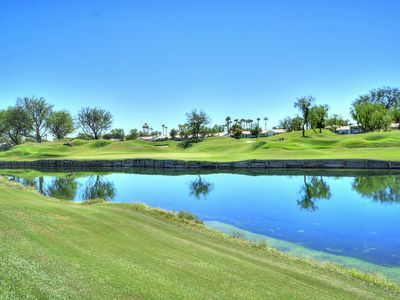 To truly make your trip a golfing extravaganza, make your way to The Madison Club, Tradition Golf Club, or Mountain View Country Club! Other outdoor activities at your disposal include ATV, jeep, and mountain biking tours. 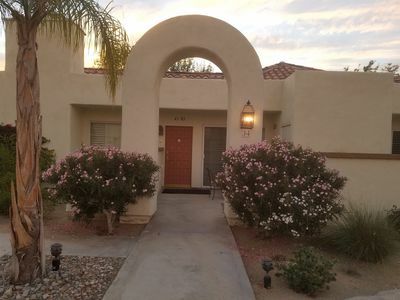 Old Town La Quinta is less than 10 minutes away, where you'll find charming shops and delicious restaurants! 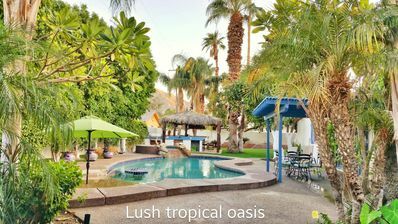 The area is also home to numerous festivals throughout the year, from the La Quinta Arts Festival to the Coachella Valley Music Festival. 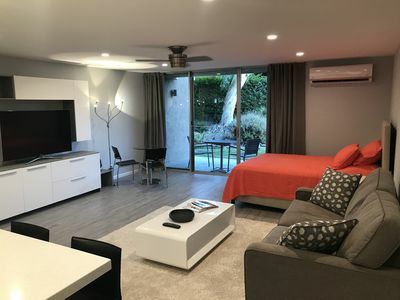 - Amenities include a fully equipped kitchen, outdoor kitchen, flat-screen cable TV, free WiFi, central heating and air conditioning, a gas fireplace, linens, towels, in-unit laundry machines, a furnished patio, fire pit, community pool and hot tub, garage and driveway parking, and more! 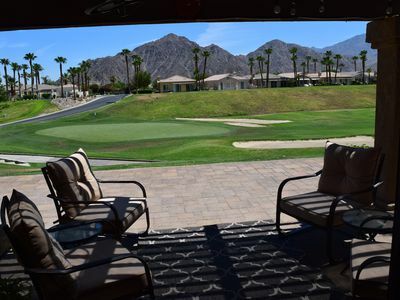 - Incredible Rancho La Quinta Golf Club Location - Minutes from an abundance of outdoor activities, Old Town La Quinta, and several events! 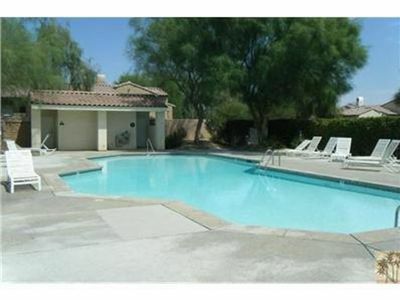 Great Condo in Palm Desert ~ Preferred Location. Super Clean! 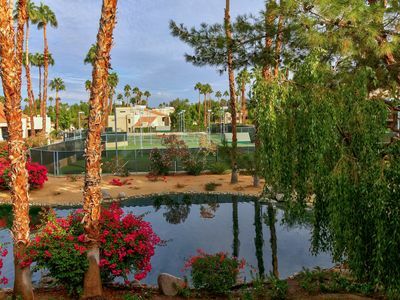 Hidden Desert Oasis designed with you in mind. 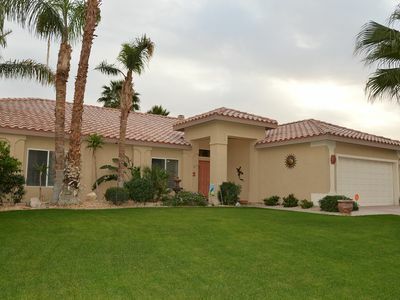 Beautiful Villa for your perfect Palm Springs Get Away!! !